Villa Le Terrae is a charming holiday home in a fabulous location at the very Heart of Italy. Amidst the vineyards, oak forests, and sunflower fields of the Tiber valley, it borders Umbria, Lazio and Tuscany. We have opened our vacation home to travelers since 1998. The Villa is a perfect base to explore Rome, Spoleto, Orvieto, Assisi, Perugia, Civita di Bagnoregio, Lake Bolsena and the Mediterranean Sea. In addition there are innumerable other art cities, quaint hilltowns, and naturalistic and archaeological sites, all within half an hour to one hour distance from the Villa. Florence is two hours away by train, and within day trip range. Our Villa is situated in a panoramic and peaceful position that is extremely well connected by the main A1 freeway and central train system that runs north and south through the Italian peninsula. The very spacious villa (3.500 SQFT) with three + levels comfortably accommodates 6 people with three double bedrooms and three and a half bathrooms. It is also wonderfully spacious for just a couple, with open verandas on every side to choose from to optimize the views and lighting any time of day. The Villa is furnished, entirely floored with terracotta tiles, and finished with hand-painted ceramic tiles in the kitchen and bathrooms. Le Terrae has all the warmth and comfort to make you feel at home. A spacious round staircase in the heart of the villa features an architecturally designed and fine crafted spiral wrought iron handrail, painted in a Mediterranean shade of blue, comfortably linking the three levels. The first floor has a spacious living room with a sofa, and a great 11-foot long antique table for unforgettable celebrations. There is also a fully equipped kitchen with a second smaller dining table, one double bedroom and one bathroom with shower. The second floor has a living area complete with a fireplace, couches, and a table ideal for quiet activities, games, telecommuting, or opening a big map to study the area for the next day’s adventures. The large room opens up onto the covered, furnished terraces with many colorful flower pots. From the terraces, and along the full perimeter of the villa, are open views of the surrounding landscape and garden, with roses, jasmines, lilacs and lavenders. Villa Le Terrae is unique in that it has large living spaces and yet it also has many cozy niches perfect for those wanting some individual time. On the third floor two bedrooms: a master suite with king-size bed and en-suite bathroom with tub, one room with double bed (or two twins, depending on the guest’s preferences), and a bathroom with shower. The enchanting views from the windows open to the lush landscape of the Cimini Mountains and the rolling hills of Umbria. The choruses of birds in the adjacent hazel nut orchards and vineyards provide a delightful background completing this idyllic vision. On the large and completely private and enclosed 5 acres property, there is a wonderful centuries old oak, that is among the largest ones in the area. Beneath this monumental oak is a very large table for al fresco dining, and an adjacent bocce-ball court. Closer to the villa, an outdoor traditional wood oven to cook fantastic bread, pizzas, or locally raised whole roasted chicken with potatoes dressed in the centuries old fashion of the local farmers. The whole Villa is rented undivided, with no other buildings on its grounds. In addition to being a tremendous value, Le Terrae is spacious, light-filled, elegant, and full of carefully designed architectural details. • Please NOTE: While we welcome all families and PRIVATE groups of friends traveling to our beautiful area, we do not rent the villa as a base for third party, commercial activities of any type. Included: - Wireless Internet Connection. - Weekly cleaning and change of linens. - Special Features: - Two very large living rooms on two levels; - Mature landscape including one of the largest oak tree in the area. - An outdoor traditional wood oven to cook pizza and other typical dishes from the area; - Bocce court. Speak directly with sisters owners in the US and in Italy. A most beautiful villa in Vasanello...our home base while we traveled through Italy! We so enjoyed our stay at LaTerrae! Anna was so helpful with information while we planned and kept us organized during the pre travel period. Allesandra was truly a blessing...welcoming us when we arrived with a beautiful spread of fruit, sweets & wine! She was available throughout our stay. The villa is incredible and housed the seven of us with plenty of room to spare. The house is beautifully decorated and so clean. We were so comfortable there. We were close to the train station in Orte when we traveled into Rome and Florence. We also enjoyed a dinner at a local restaurant Maria Rosa in Vasanello. Its a wonderful place to relax amid the beautiful grounds. We highly recommend this to everyone and hope to return some day to further travel through much more of Italy. A fabulous stay at a fabulous villa!!! The property was spacious, clean and well furnished. The spacious property was great for our family of 8. The open living kitchen, dining and TV space worked very well keeping everyone in the one space, but without crowding. The location was superb for day trips exploring the region, and the train to Rome was an easy 40min journey. Orte and Vasanello both historic and beautiful and supermarkets in both towns excellent and close by. Alessandra was very welcoming and it was our pleasure to look after the 2 lovely cats that live at the property while we were staying at their place! The weather was hot both day and night during our August holiday. As there were screens on all the windows it did mean windows could be kept open to maximise a night time breeze and because the house has so many lovely covered porches the inside of the house remained relatively cool during the day. It is a great holiday home and we would recommend it to anyone who enjoys country living or looking for an escape from city living. Ideal family accommodation in a beautiful setting. We knew our family holiday (7 of us, 3 generations) was going to be special, but it was much more than that because of the wonderful hospitality shown by Alessandra and Anna. The villa was perfect. With 35 -40 degree outside the kitchen and living spaces were still cool enough to socialise and eat. There was more than enough shade to enjoy the outside spaces too. Alessandra met us on arrival (even though we were 1hr 30min later than expected) and took time to show us round, we were welcomed with a cold bottle of locally sourced white wine, and a large bowl of local fruit perfectly ripe. Everything about the house was as described - if not better. Comfortable, practical and more than anything, beautiful. The lovely Tuscan style building over four floors was always lovely to move around in. Note* For those that have mobility issues the ground floor has two bedrooms, the kitchen, bathroom and a living space - which should be everything you need - in easy access. The nearest large town, is a fabulous hill top old commune with loads of history. It has a busy train station which means getting in to Rome is a lot easier than by car. Orte to Rome is about 40mins and with a BIRG ticket (12 Euros each) you can get a return ticket (any time of the day) and all the public transport you want in Rome (Metro and Buses for the whole day). On another day we took a car journey to Florence. If you hire a car and want to go to Florence then we would recommend getting the park and ride Tram stop at Villa Constanza, just outside Florence. Its very easy to park and the Tram journey is great fun too. Florence is beautiful. 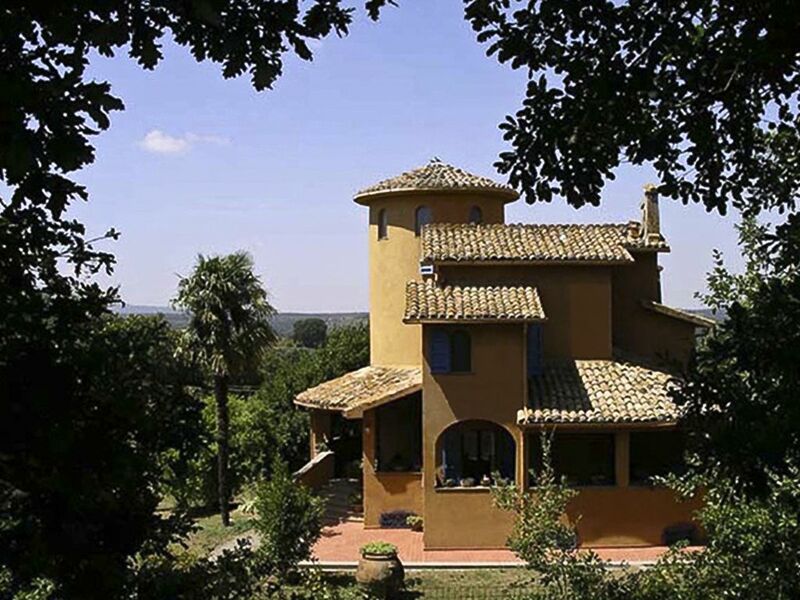 From the villa you are in driving distance of Lake Bolsena, and also Ovierto an ancient hill top city with the finest Gothic cathedral that Europe has to offer. We also ventured to Porto Santo Stephano - a Monaco-esque yachting / fishing port. All in all this villa is the perfect setting to enjoy a holiday close to home or by train or car to venture further afield. Thanks to Anna and Alessandra for making us feel so welcome. It was lovely. Other practical things to note - washing facilities at the villa worked well, so washing clothes and getting them dry was easy (there's also an airer if its raining outside). The dishwasher was great to have, wifi worked well in the living areas (and most of the house). Cooking was made easier by having the oven and hob, with plenty of different metal pans, crockery etc. First time in Italy and couldn't have asked for a nicer experience. The drive from Rome was quite straightforward and the reputation of Italian drivers didn't live up to expectations thankfully. The lovely Alessandra met us at a garage near the villa to guide us in at Midnight! Thank you so much for that Alessandra. Villa was as expected, tastefully furnished and Alessandra had already stocked up on bread, milk, eggs, English breakfast tea, bread and jam, organic mainly. The villa is tucked away from the main road so no noise, only some nice classical music and the slosh of wine into the glass, Heaven. Beds really comfy and internet good enough so long as everyone doesn't download all sorts at the same time. The Coop Supermarket in Orte seems best for daily items and the wine is unbelievably cheap without comprising quality. Try Maria Rosa restaurant up the road in Vasanello, great sea food and the clams were fabulous. Get the train from Orte into Rome for sightseeing (don't drive into Rome!!!). Overall the holiday was great and Italians very friendly, try a couple of words in Italian it's always appreciated even if it probably sound's awful. Feed the cats and take out the correct rubbish for recycling and everyone is happy. We used to go to Turkey every year but I think we may have found a happy alternative. We stayed 1 week at the Le Terrae Villa and a few days at the Rome Apartment. The villa is a very private property with lots of space to relax. We took many trips to the surrounding hilltowns. Orte is the closest and we enjoyed being able to go their in the evenings for dinner. The Rome Apartment was perfect! Again lots of space and very quiet in the evenings because we weren't down in the main tourist area. Its located very close to the train stations and buses and easy to access. We look forward to returning soon! We would like to thank you for a wonderful stay. We enjoyed the beautiful villa, spent hours walking through the neighbouring towns, and visiting Florence, Norcia, Montalcino, Canepina, Vasanello and Orte. Your suggestions and directions were perfect and made our visit very comfortable. Also, our cooking class with Dolores was a highlight and we cannot wait to get home to impress our family and friends with all we learned. She is a treasure! Dave loved feeding the cats and hanging the laundry to dry, and relaxing by the fire at night was a gig. Thank you for sharing this special place with us! - Less than an hour from Rome - border of Umbria and Northern Lazio and Tuscany. Within 1 hour from Spoleto, Orvieto, Assisi, Perugia, Todi, Viterbo, Civita di Bagnoregio, Tarquinia, Bolsena and Vico lakes and the Argentario beaches. RULES OF THE HOUSE -Fee/Damage Deposit: The fee and damage deposit are set according to the reservation made through HomeAway. -Additional Persons/Replacements: No guests, pets, or creatures of any kind other than the humans identified in the booking. If Guest would like to change the details of an accepted reservation, (i.e. add a guest, which may incur additional charge) this will be requested by contacting Host via email. -Absolutely no parties with non-renting guests. Should we find any violations to this clause, it is totally up to our discretion to ask you to vacate the house. -Included: Water, electricity and heating; Wireless Internet connection; bed and bath linens; Final cleaning and one weekly cleaning and change of linens for stays of multiple weeks. The kitchen is fully equipped with all necessary appliances and utensils, including dish-washer and an Italian moka coffee maker (stovetop). Host presents the Italian traditions and uses, and therefore drip coffee makers, toasters or microwave ovens are not provided. Extras: -Telephone: Guest agrees to put any calls made from the property telephone land line on a pre-paid calling card. -Firewood only for the fireplace on the second level of the villa and for the outdoor wood oven. -Anything else not specifically included in the description of the house. -The cost of any unpaid extras and eventual telephone charges will be deducted from the Security Deposit, if the correct amount is not left in cash on departure. -Host/Guest Responsibilities: Host and Guest agree to fulfill their respective responsibilities as described on the HomeAway website with the additions and modifications included in this Agreement.